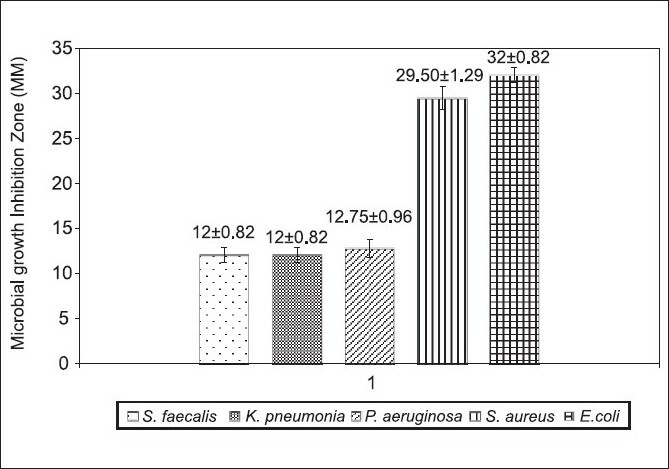 Mentha piperita essential oil was bactericidal in order of E. coli> S. aureus > Pseudomonas aeruginosa> S. faecalis > Klebsiella pneumoniae. The oil with total phenolics of 89.43 ± 0.58 μg GAE/mg had 63.82 ± 0.05% DPPH inhibition activity with an IC 50 = 3.9 μg/ml. Lipid peroxidation inhibition was comparable to BHT and BHA. A 127% hike was noted in serum ferric-reducing antioxidant power. There was 38.3% decrease in WBCs count, while platelet count showed increased levels of 214.12%. Significant decrease in uric acid level and cholesterol/HDL and LDL/HDL ratios were recorded. The volatile oil displayed high cytotoxic action toward the human tumor cell line. The results of this study deserve attention with regard to antioxidative and possible anti-neoplastic chemotherapy that form a basis for future research. The essential oil of mint may be exploited as a natural source of bioactive phytopchemicals bearing antimicrobial and antioxidant potentials that could be supplemented for both nutritional purposes and preservation of foods. Thymus vulgaris L. (Lamiaceae) is a well-known medicinal plant that contains important compounds such as thymol and carvacrol and it has been used in many pharmaceutical dosage forms. 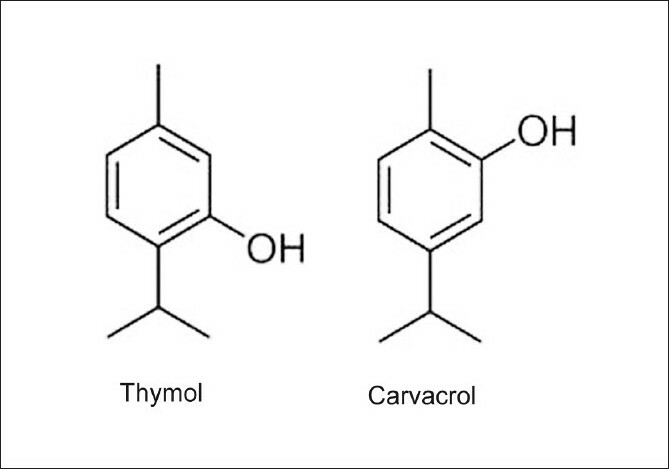 Thymol and carvacrol in essential oils are often quantified by gas chromatography (GC) technique but in this work, a validated and reliable high performance liquid chromatography (HPLC) method has been developed for the analysis of these two components in T. vulgaris essential oil. The essential oil of the plant was analyzed by HPLC and GC techniques. The HPLC system consisted of ACE C 18 column and an isocratic acetonitrile:water (50:50) as the mobile phase which was kept at a flow rate of 1 ml/min. The method was validated for selectivity, linearity (r2 > 0.997 for both thymol and carvacrol), precision (intra-day 0.8-1.9, 1.7-2.6; and inter-day 3.5-4.5, 3.6-4.7) and recovery (97.7%, 97.6%) for thymol and carvacrol, respectively. The limits of detection (LODs) and limits of quantization (LOQs) were calculated to be 2.8, 0.6 μg/ml and 8.6, 1.8 μg/ml for thymol and carvacrol, respectively. The GC system consisted of flame ionization detector (FID) and CP-SIL 8 column. The concentrations of thymol and carvacrol in essential oil obtained by HPLC (41.2%, 4.3%) and GC (40.7%, 4.2%) were compared by statistical methods and they showed good agreement. The research aimed to screen and exploit molluscicidal microorganisms against Oncomelania hupensis, from the rhizosphere of medicinal plant, Phytolacca acinosa Roxb., and one strain named as SL-30 was obtained with excellent molluscicidal activity. The freeze-dried powder of exocellular broth (EXB) of SL-30 could kill 100% of snails at a concentration of 48 mg/l for a submerged period of 24 h, with stabile molluscicidal activity at a temperature lower than 60°C; furthermore, it could be gradually degraded after exposure to illumination for 15 days. The freeze-dried powder of SL-30's EXB was safe to fresh fish and shrimp, even at a concentration beyond LC 90 of 24-h exposure period. The glycogen and total protein content of soft tissues of snails decreased after treating with SL-30's EXB, and glycogen content's decreasing rate had a linear relationship with molluscicidal activity. Finally, phylogenetic analysis based on ITS sequence showed that strain SL-30 had a higher similarity to Aspergillus fumigatus with bootstrap value 98%; accordingly, it was identified as a species of Aspergillus. The toxicity of Xanthorrhoea johnsonii methanolic leaf extract was investigated using the Artemia franciscana nauplii bioassay. At 24 h, the extract produced an EC 50 of 361.0 ± 41.8 μg/ml, indicating that it was substantially more toxic than the pesticide Mevinphos (1346.2 ± 80.1 ΅g/ml) and approximately 4 fold less toxic than potassium dichromate (87.1 ± 5.2 μg/ml). Whilst potassium dichromate LC 50 values remained constant across the 72-h test period, these values decreased for the extract and Mevinphos to similar values (199.8 ± 60.5 and 114 ± 12.8 μg/ml, respectively), indicating their similar level of efficacy. 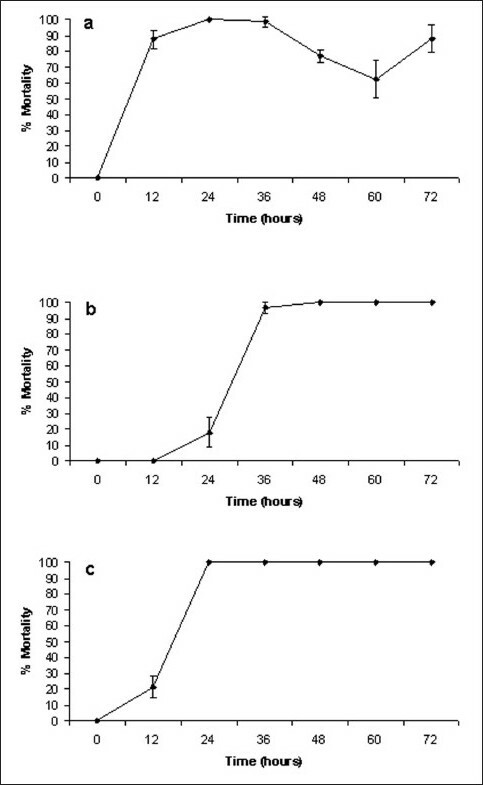 Noteworthy was the apparent anesthetic effect of X. johnsonii leaf extract. 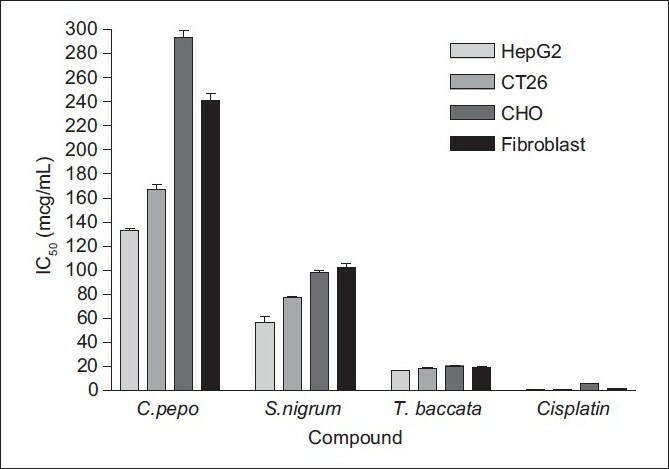 Although the extract initially appeared to kill the A. franciscana nauplii, they were seen to temporarily recover by 48 h only to die by 72 h.
This study was conducted to evaluate the in vitro antimicrobial properties of essential oil, its major component, 1,8-cineole, and extracts of two Eucalyptus species, Eucalyptus intertexta and Eucalyptus largiflorens. 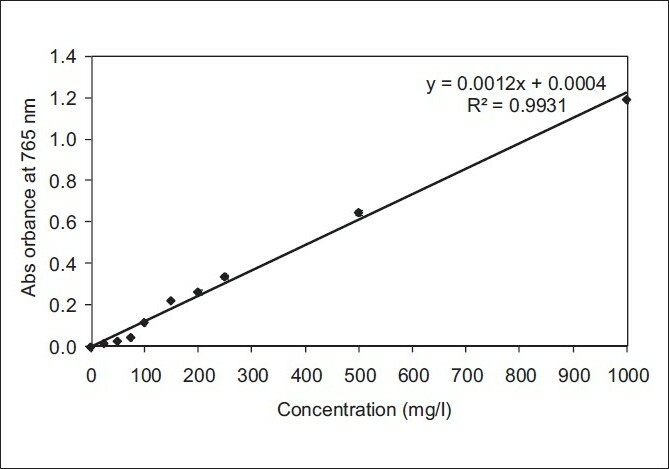 Minimum inhibitory concentration (MIC) of the extracts was calculated by broth dilution method and the zone of inhibition was studied by agar disk diffusion method. Gentamicin (10 μg/disk) and rifampin (5 μg/disk) were used as reference controls for antibacterial studies and nystatin (100 μg/disk) for antifungal studies. The results of MIC study revealed that the essential oil has a stronger activity and broader spectrum than those of methanol extracts. It is interesting to point out that the oils had even greater potential of antimicrobial activities than those of 1,8-cineole as their main component. Plants are used worldwide for the treatment of diseases, and novel drugs continue to be developed through research from plants. There are more than 20,000 species of plants used in traditional medicines, and these are all potential reservoirs for new drugs. Cucurbita pepo has been used in traditional folk medicine to treat cold and alleviate ache. Previous pharmacological tests have shown that it possesses antiviral, anti-inflammatory, and analgesic effects. Also, Solanum nigrum has been used as a diuretic and an antipyretic agent and it has also been used to cure inflammation, edema, mastitis and hepatic cancer. In this investigation, cytotoxicity of specific concentrations of hydro-alcoholic extracts of C. pepo and S. nigrum was studied on normal [Chinese hamster ovarian cells (CHO) and rat fibroblast] and cancer (HepG2 and CT26) cell lines. The cytotoxic effects and IC 50 of the extracts on the selected cell lines were studied followed by colonogenic assay method. The results showed that IC 50 of S. nigrum extract was significantly lower than that of the C. pepo extract on all four cell lines (P < 0.05). On the other hand, IC 50 of S. nigrum extract was significantly higher than the extract of Taxus baccata and Cisplatin, herbal and chemical control positive anticancer compounds, respectively, on all four cell lines (P < 0.05). As a result, it is concluded that the extract of S. nigrum has almost similar cytotoxicity to the extract of T. baccata on cancer cells. For the first time, callus and suspension cultures of Linum linearifolium were initiated. Podophyllotoxin (PTOX), a strong antitumor precursor, was isolated from the calli and suspension, as a main lignan besides smaller amount of 6-methoxypodophyllotoxin (6MPTOX). L. linearifolium is now the third Linum species of section Syllinum, with PTOX as the main lignan. The amounts of lignans, especially PTOX, found in L. linearifolium cell cultures are quite high within the studied Linum species until now. The antiproliferative effects of extracts were tested in a panel of human tumor cell lines, using the MTT [3-(4,5-dimethylthiazol-2-yl)-2,5-diphenyl tetrazolium bromide]-dye reduction assay. The lignan mixtures caused concentration-dependent inhibition of malignant cell proliferation and showed moderate cytotoxic activity. The results clearly demonstrate that the lignan mixture of L. linearifolium exerts inhibitory effects against malignant cells. Aqueous extracts of mature leaves of Artocarpus heterophyllus (jak) are used by traditional medical practitioners in Sri Lanka and India for the treatment of diabetes. This study was conducted to investigate the hypoglycemic and hypolipidemic effects of an ethylacetate (EA) fraction of the mature leaves of A. heterophyllus in a streptozotocin (STZ) induced diabetic rat model. In normoglycemic rats, administration of a single dose (20 mg/kg) of the EA fraction resulted in a significant (P < 0.05) reduction in the fasting blood glucose concentration and a significant improvement in glucose tolerance (P < 0.05), compared to the controls. 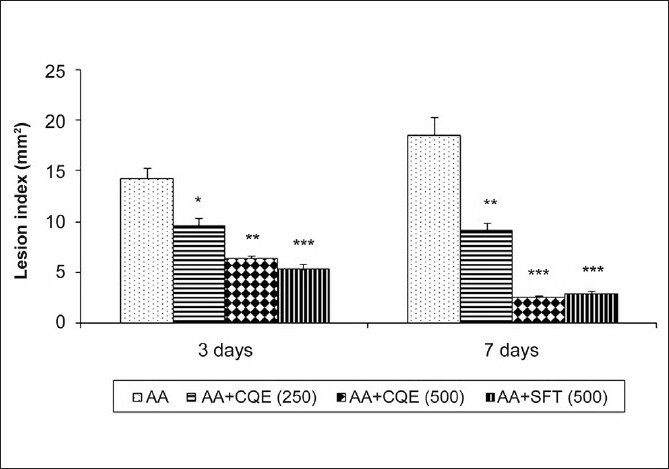 In STZ-induced diabetic rats, chronic administration of the EA fraction of A. heterophyllus leaves daily for 5 weeks resulted in a significant lowering of serum glucose, cholesterol and triglyceride (TG) levels. Compared to control diabetic rats, the extract-treated rats had 39% less serum glucose, 23% lower serum total cholesterol and 40% lower serum TG levels and 11% higher body weight at the end of the fifth week. The percentage reductions in the serum parameters mediated by the test fraction were comparable with those produced by glibenclamide (0.6 mg/kg), the reference drug used in this study. It can be concluded that the EA fraction of A. heterophyllus leaves contains one or more hypoglycemic and hypolipidemic principles which have the potential to be developed further for the treatment of diabetes specifically associated with a hyperlipidemic state. 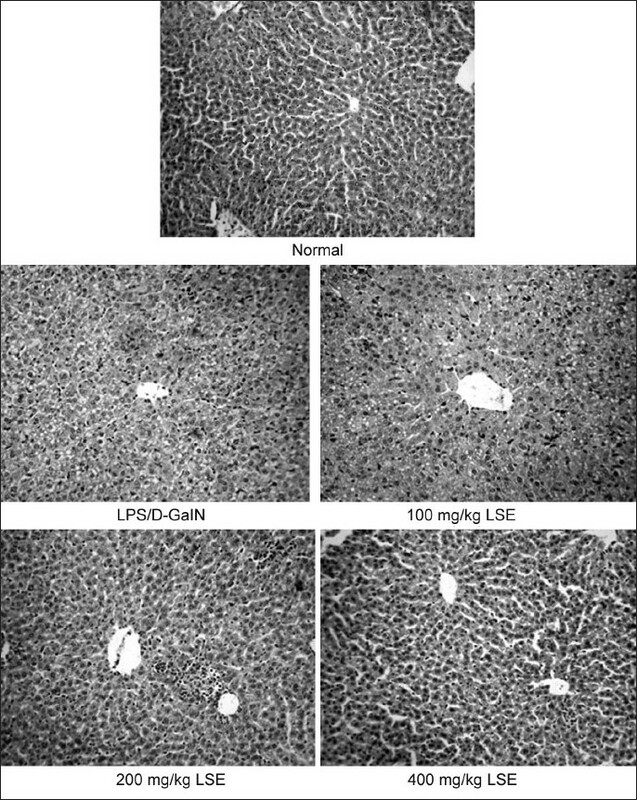 Mechanisms underlying the mitochondrial protection of Limonium sinense extracts (LSE) was studied in lipopolysaccharide and D-galactosamine (LPS/D-GalN) intoxicated mice. It was found that increased activities of serum aspartate aminotransferase and alanine aminotransferase induced by LPS/D-GalN were significantly inhibited by pretreatment with LSE. The obvious disruption of membrane potential, intramitochondrial Ca 2+ overload and suppression in mitochondrial Ca 2+ -ATPase activity induced by LPS/D-GalN were significantly blocked by pretreatment with LSE. It was concluded that mechanisms underlying protection of LSE against liver mitochondria damage might be related to the preservation on mitochondrial Ca 2+ homeostasis through the preservation on mitochondrial Ca 2+ -ATPase activity. Fourteen purple-black American elderberry accessions (Sambucus canadensis L.) obtained from various sites in midwestern USA and then grown at a single Ohio production site in USA were analyzed for their total phenolic (TP) and total monomeric anthocyanin (TMA) contents and for their antioxidant capacity by the ferric reducing antioxidant power (FRAP) and DPPH radical scavenging assays. Total phenolic and anthocyanin contents were measured using the Folin-Ciocalteu reagent and the pH differential methods, respectively. Overall, the phytonutrient contents and antioxidant capacity of our elderberry accessions were similar to those typically reported for black raspberries, blackberries and other dark-fleshed small fruits. Variability among accessions was greatest for TMA content (CV 37.5%); individuals ranged nearly threefold from 1308 to 4004 μg cy3-GE/g on a fresh weight basis. Variation among accessions was also evident for TP, FRAP and DPPH values (CV 14.4, 21.7 and 26.8%, respectively). TP and TMA values were very highly correlated (r = 0.93), although individuals differed in the estimated proportion of total phenolics attributable to anthocyanins. Both TP and TMA also highly correlated to antioxidant capacity values (r = 0.70-0.85). 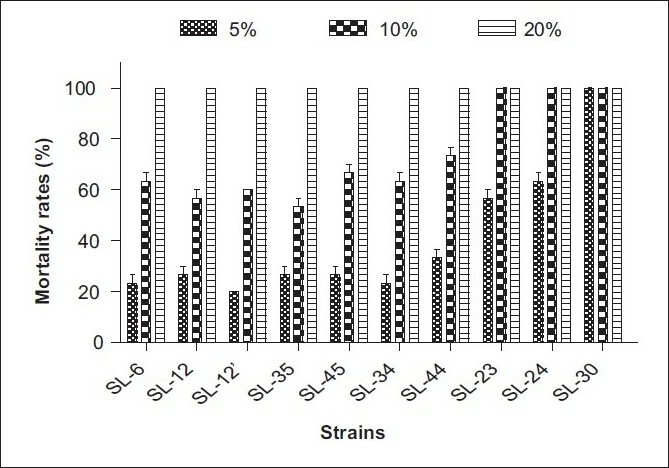 Within this limited study of 14 accessions, variability for phytonutrient content and antioxidant capacity suggested the employment of wild germplasm within an elderberry improvement program to incorporate an array of superior horticultural, post-harvest or processing traits into new or existing cultivars with superior phytonutrient profiles. The hexane, ethylacetate and methanol extracts from Bauhinia tomentosa and Bauhinia vahlii roots were tested for their antimicrobial activity against Gram-positive bacteria (four strains), Gram-negative bacteria (three strains) and three fungi strains using microdilution methods, for the determination of minimal inhibition concentration (MIC) and the minimal microbicidal concentration (MMC). The MIC values of hexane extracts of B. tomentosa and B. vahlii roots were more than 250 μg/ml. The MIC values of ethylacetate and methanol extracts of B. tomentosa roots varied from 7.81 to 31.25 μg/ml and 31.25 to 62.50 μg/ml, respectively. The MIC values of ethylacetate and methanol extracts of B. vahlii roots varied from 15.63 to 62.5 μg/ml and 62.5 to 250 μg/ml, respectively. MMC values obtained are two times greater than the corresponding MIC values. The activities of ethylacetate extracts are attributed to the presence of flavonoids and that of methanol extracts are attributed to the presence of tannins. The essential oil of the fruit of Illicium griffithii Hook f. et Thoms. was extracted using Clevenger's apparatus. 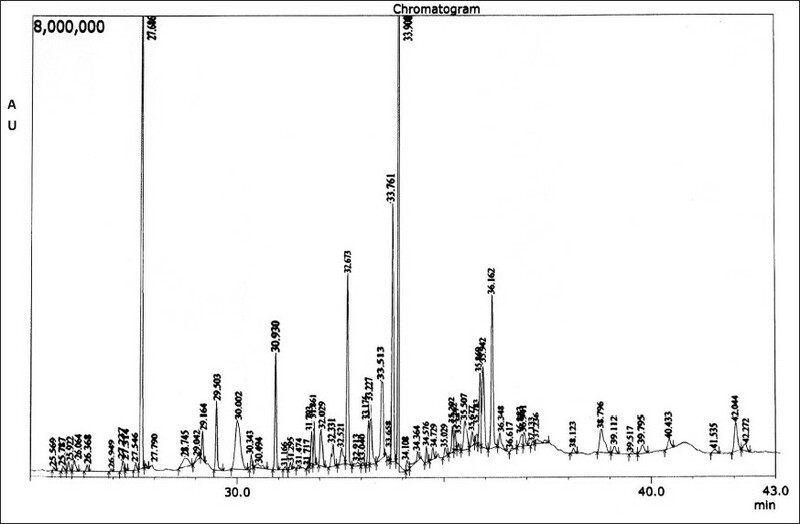 Forty-one compounds were characterized by gas chromatography-mass spectroscopy (GC-MS). 4-Methyl-6-(2-propenyl)-1,3-benzodioxole was characterized as the major constituent, followed by linalool amongst the volatile constituents. The essential oil was found to be effective against Aspergillus niger, Penicillium spp. and Saccharomyces cerevisiae and possessed considerable activity against Staphylococcus aureus and was inactive against Klebsiella pnemoniae, Pseudomonas aureginosae, Proteus vulgaris and Escherichia coli. Psidium guajava L. leaves were subjected to extraction, fractionation and isolation of the flavonoidal compounds. 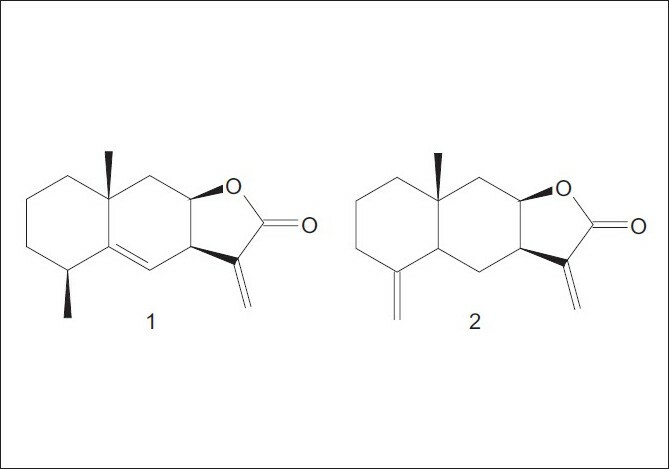 Five flavonoidal compounds were isolated which are quercetin, quercetin-3-O-α-L-arabinofuranoside, quercetin-3-O-β-D-arabinopyranoside, quercetin-3-O-β-D-glucoside and quercetin-3-O-β-D-galactoside. Quercetin-3-O-b-D-arabinopyranoside was isolated for the first time from the leaves. Fractions together with the isolates were tested for their antimicrobial activity. The antimicrobial studies showed good activities for the extracts and the isolated compounds. Methanol extract of the aerial parts of Phlomis persica Boiss. (Lamiaceae) (PPE) was studied to evaluate the effects of antidiabetic potential, by measuring fasting blood glucose, insulin, total antioxidant power (TAP), using ferric reducing antioxidant power (FRAP), lipid peroxidation (using thiobarbituric acid reactive substances, TBARS), superoxide dismutase (SOD), catalase (CAT), and glutathione peroxidase (GPx) on streptozotocin-induced diabetes in rats. Male Wistar rats were randomly divided into five groups of six animals each. Oral administration of PPE at doses of 100 and 200 mg/kg once a day for 10 days resulted in a significant reduction in fasting blood glucose and an increase in serum insulin levels, in comparison with diabetic control group. It also prevented diabetes-induced loss in body weight. Hepatic TAP increased and TBARS decreased following PPE treatments. The extract at 100 and 200 mg/kg increased the activity of hepatic SOD, CAT, and GPx in diabetic rats. It is concluded that PPE has antidiabetic potential that is comparable with glibenclamide. In conclusion, the results of the present study show positive effects of P. persica on experimental diabetes and thus the antidiabetic effect of PPE is related to its potential to inhibit hepatocellular oxidative stress. The present study was designed to investigate whether Cissus quandrangularis extract (CQE) had healing effects on gastric ulcer, through modulation of polyamines and proliferating cell nuclear antigen (PCNA) in rats. Administration of acetic acid (AA) was accompanied by reduced PCNA which was determined by immunohistochemical staining, 3 H-thymidine incorporation using liquid scintillation spectrometry, mitochondrial marker enzymes, polyamine contents and transforming growth factor-alpha (TGF-a) expression in gastric mucosa of rats. Administration of CQE after the application of AA to the stomach enhanced the reduction of ulcer area in a dose-dependent manner which was confirmed by histoarchitecture. Moreover, CQE significantly increased the 3 H-thymidine incorporation and the levels of polyamines such as putrescine, spermine and spermidine in ulcerated rats. In addition, the extract offers gastroprotection in the ulcerated area by increased expression of TGF-a and also reversed the changes in the gastric mucosa of ulcerated rats with significant elevation in mitochondrial tricarboxylic acid (TCA) cycle enzymes and PCNA levels. Based on these results, the healing effect of CQE on AA induced gastric mucosal injury in rats may be attributed to its growth promoting and cytoprotective actions, possibly involving an increase in tissue polyamine contents and cell proliferation. 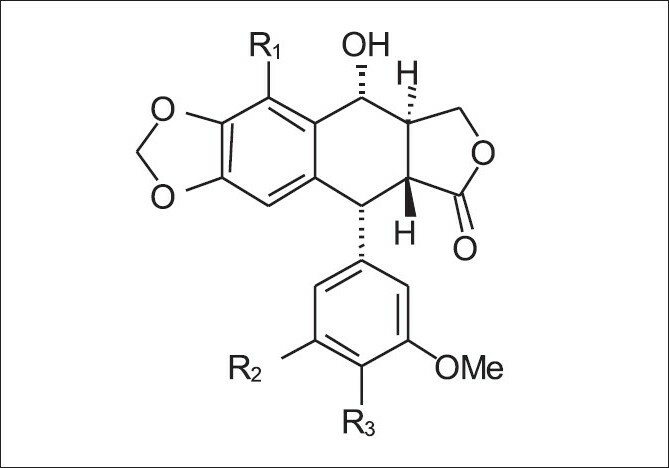 This work deals with ultrasound-assisted extraction (UAE) of alantolactone and isoalantolactone from the roots of Inula helenium L., a well-known medicinal plant. The effects of ethanol concentration, extraction time, temperature and number of extraction steps on the extraction yields of both sesquiterpene lactones were investigated. Gas chromatographic (GC) method was used for simultaneous determination of their contents in the corresponding extracts. A comparison with classical extraction methods [maceration, infusion and micro steam distillation-extraction (MSDE)] showed that the amounts of alantolactone and isoalantolactone achieved by UAE with 70 and 96% EtOH for 30 min at room temperature were higher or almost equal to those obtained by maceration for 24 hours. Rosa canina L. is a member of Rosaceae family, which is well-known for its high phenolic contents. These compounds are known to possess antioxidant, antimutagenic and anticarcinogenic effects. However, they have yet to pass controlled clinical trials for efficacy, and their potential for prooxidant activity is an understudied field of research. In order to estimate the correlations between phenolic contents and antioxidant/proxidant effect mechanisms, different concentrations of R. canina fruit extracts were examined in this study. R. canina showed antioxidant activities at all concentrations with respect to the reducing power, hydrogen peroxide scavenging activity and superoxide anion radical scavenging (O2·-) activity assays, whereas a negative correlation was observed with the metal ion chelating activity and free radical scavenging activity [1,1-diphenyl-2-picryl-hydrazil (DPPH) % inhibition] assays at higher concentrations with the phenolic content of R. canina. These results suggest that R. canina may act not only as an antioxidant, but also as a prooxidant with the effects depending on its concentrations. Tamarindus indica L. leaves are reported worldwide as antibacterial and antifungal agents; however, this observation is not completely accurate in the case of Cuba. In this article, decoctions from fresh and sun dried leaves, as well as fluid extracts prepared with 30 and 70% ethanol-water and the pure essential oil from tamarind leaves were microbiologically tested against Bacillus subtilis, Enterococcus faecalis, Staphylococcus aureus, Escherichia coli, Salmonella typhimurium, Pseudomona aeruginosa and Candida albicans. Aqueous and fluid extracts were previously characterized by spectrophotometric determination of their total phenols and flavonoids, while the essential oil was chemically evaluated by gas chromatography/mass spectroscopy (GC/MS). Experimental data suggest phenols as active compounds against B. subtilis cultures, but not against other microorganisms. On the other hand, the essential oil exhibited a good antimicrobial spectrum when pure, but its relative low concentrations in common folk preparations do not allow for any good activity in these extracts. The leaves of Pereskia grandifolia Haw. (Cactaceae), commonly known as "Jarum Tujuh Bilah" in Malaysia, have been traditionally used as natural remedy in folk medicine by the locals. In the present study, the antioxidant potential of P. grandifolia crude methanol and its fractionated extracts (hexane, ethyl acetate and water) have been investigated, employing three different established testing systems, such as scavenging activity on 1,1-diphenyl-2-picrylhydrazyl (DPPH) radicals, reducing power assay and b-carotene method. The total phenolic content of the P. grandifolia extracts was also assessed by the Folin-Ciocalteau's method. The ethyl acetate extract showed significantly the highest total phenolic content, DPPH scavenging ability and antioxidant activity in b-carotene bleaching assay while the hexane extract possessed significantly strongest reducing power. The data obtained in these testing systems clearly establish the antioxidant potency of P. grandifolia. As such, this is the first report on the antioxidant activities of P. grandifolia.